The Busselton Jetty had fallen into a state of disrepair, and the 2km jetty was declared unsafe some years ago. When a Busselton boy became WA Treasurer the money was found to rebuild the jetty again. It was reopened to the public on the 5th February 2011. This image is approximately 5 seconds exposure. 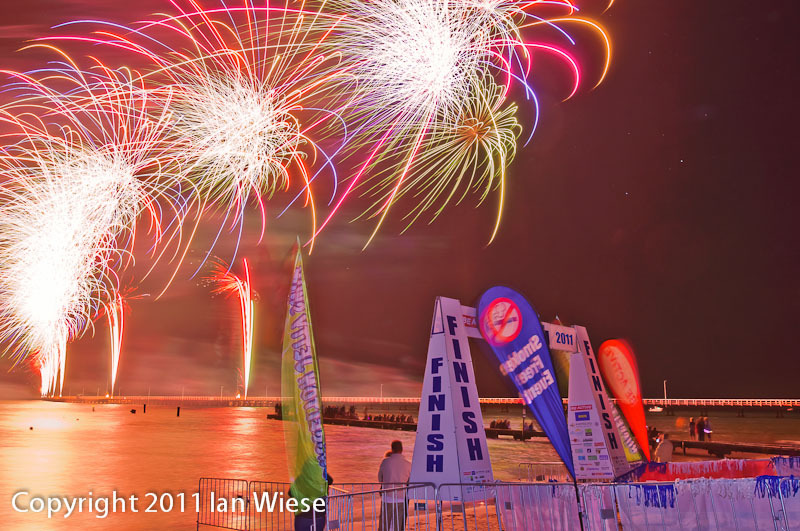 I selected this vantage point to show the fireworks in the context of the jetty, the small swimming platform, and the banners which would be used next day at the end of the Busselton Jetty swim. This entry was posted on March 1, 2011 by ianwiese. It was filed under Busselton Jetty, Landscape and was tagged with Busselton Jetty, dawn, fireworks.